Jimmy Reed was a hugely influential figure of the blues and R&B scene during the 1950s and early ‘60s, not only for the fact that he brought his distinctive style of electric blues to mainstream audiences, but also because in the process he inspired many aspiring talents on both sides of the Atlantic, notably The Rolling Stones, Eric Clapton, Jerry Garcia, Stevie Ray Vaughan and Van Morrison, who all recorded versions of various Jimmy Reed R&B hits. He came to prominence in the early ‘50s when he was one of the first artists to sign to VeeJay, and over the years scored around twenty Top 20 R&B hits, with a dozen or more pop chart entries as well, underlining his importance as a crossover artist. 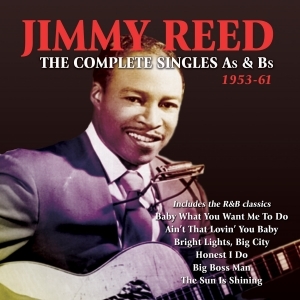 Among them were memorable classics, which have been much covered over the years, such as “Ain’t That Loving You Baby”, “Honest I Do”, “Little Rain”, “Baby What You Want Me To Do” and “Bright Lights, Big City”, all of which are included in this great value 54-track 2-CD collection, which comprised every A and B side he released from his debut in 1953 through to the first months of 1962. It’s a thorough and entertaining overview of the key formative years of the career of a significant blues stylist.